CAG Purification offers a from stock one-stop source solution for all compressed air filter element requirements. As filtration specialists, we supply one of the most comprehensive ranges of independently validated alternative filter elements, air/oil separators and vacuum pump separators on the market today. Specially designed to fit original manufacturers equipment, Walker Filtration's range of alternative filter elements offer certified performance levels to meet stringent and specialist specifications. Our policy of "equal or better than" ensures that customers buying Walker alternative elements can do so with complete confidence. 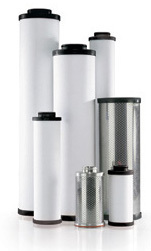 Using multi-wrap technology, reinforced with steel metalwork and nylon end caps ensures that Walker Filtration’s alternative filter elements offer a low pressure loss performance resulting in efficient, clean air, something that is crucial in today's compressed air industry. All alternative filter elements have been independently tested and validated using ISO 12500 to meet the requirements of ISO 8573-1:2001(E).